Kāwhia Harbour contains numerous inlets and points. 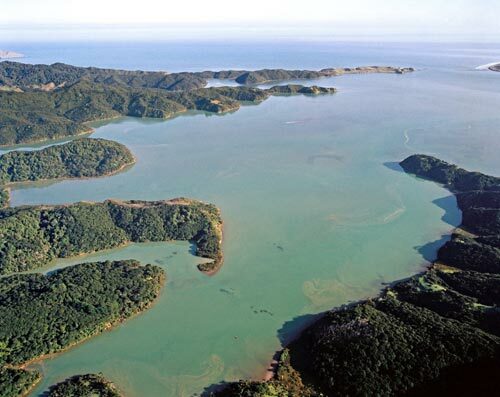 Visible in this aerial photograph are Urawhītiki Point – the most distant point at the mouth of the harbour – and, to its left, the settlement of Te Māika, which is only accessible by boat. In the foreground to the right is Kōwhai Point, where the first fossil ammonites (large prehistoric molluscs) discovered in New Zealand were found by geologist Ferdinand Hochstetter in 1859. The area has since been well-traversed by paleontologists.